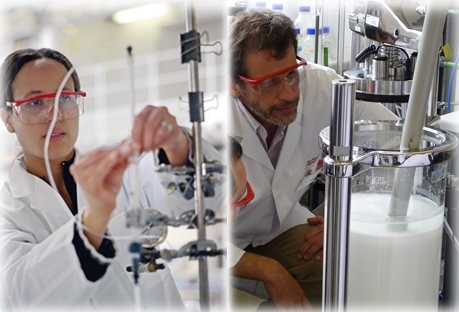 and TSKgel® chromatography media and prepacked TSKgel® HPLC columns. RPC, HILIC, SEC and affinity. 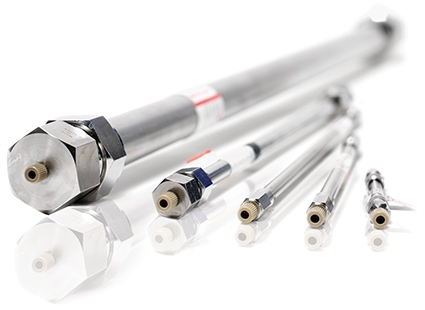 Read our Chromatography Catalog on TSKgel® columns and TOYOPEARL® media here! Tosoh Bioscience offers a broad range of prepacked columns for high-performance liquid chromatography (HPLC). They include the most widely used modes of liquid chromatography, such as ion exchange, hydrophobic and hydrophilic interaction, reversed phase, size exclusion, and affinity. 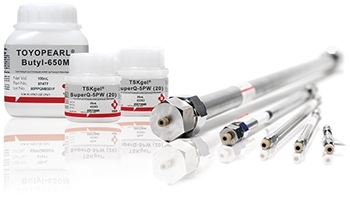 TSKgel® columns for high-performance liquid chromatography are renowned for their quality and reliability. Filled with high purity silica or polymer based resins and functionalized with a broad range of ligands the columns are utilized in a variety of research and day-to-day applications. Over 500 scientific publications, using TSKgel® columns, prove their outstanding quality and cutting-edge technology. For over thirty years Tosoh has continued to be the world leader in the analysis of proteins—our silica based TSKgel® SW columns are the industry standard for size exclusion chromatography (SEC) of proteins. The latest additions to the column portfolio comprise HILIC and reversed phase columns, filled with sub 3 µm particles—ideally suited for fast, high resolution and high sensitivity LC-MS analysis, as well as new SEC columns for improved antibody analysis. TSKgel® G3000SWXL columns have been the industry’s standard for quality control of monoclonals by SEC for decades. Based on the proven proprietary surface technology of the renowned TSKgel® SW series, a new series of silica-based SEC columns was engineered to provide shorter analysis time or higher resolution for antibody analysis. More information on the new TSKgel® SEC columns. TOYOPEARL® chromatography resins are hydrophilic, macroporous, bulk processing media designed especially for large-scale chromatography applications. TOYOPEAR®L resins are available for the most common modes of liquid chromatography: size exclusion (SEC), hydrophobic interaction (HIC), ion exchange (IEC) and Affinity chromatography (AFC). Based on their semi-rigid backbone structure TOYOPEARL® resins assure excellent pressure/flow characteristics. TOYOPEARL® is stable over the pH 2-13 range. Particle sizes are 20-40 µm superfine grade (S) for the highest performance, 40-90 µm for economical purification (M), and 90-120 µm coarse grade (C) and 100 - 300 µm extra coarse grade (EC) for the largest scale chromatography. Similar Chemistries of TOYOPEARL® and TSKgel® columns allow seamless scale up. TOYOPEARL® polymeric resins are available as bulk resin and in prepacked ToyoScreen® columns for convenient screening. The new TOYOPEARL® AF-rProtein A HC-650F is designed for high-throughput processing of high titer feedstock. It achieves 30% to 50% greater antibody adsorption than similar products and can considerably improve process economics. 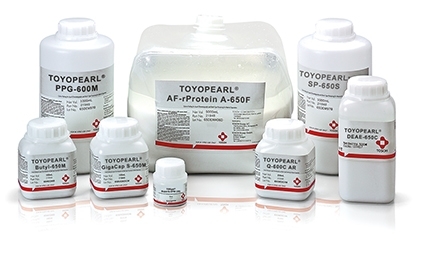 More information on the new TOYOPEARL® AF-rProtein A HC resin.